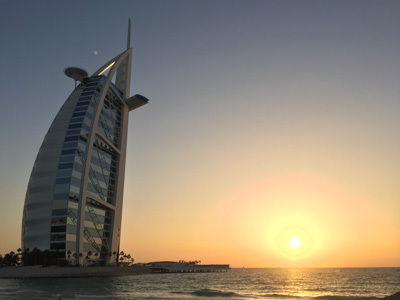 Friday 13 April we had an evening flight with Emirates from Gatwick to Dubai. The flight was a little under 7 hours and we decided to fly economy as the extra cost for business was a little hard to justify. That didn't make the night flight any easier. Saturday 14 April I was feeling shattered by the time we arrived at the Jumeirah Dar Al Masyaf resort, it was a good job we had nothing to do for the next week! We were travelling light, very light. With only a small carry-on bag each we were able to skip the usual wait at baggage reclaim. However, upon arrival at the resort we seemed to confuse all the staff who were sure they had managed to lose our cases. We arrived quite early so our villa hadn't been prepared. 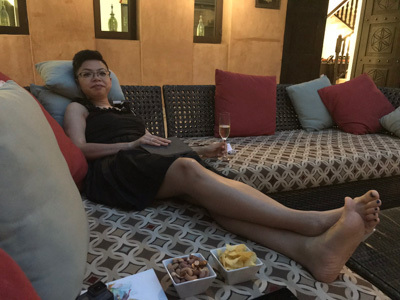 We were taken to the guest lounge where we were able to get changed and leave our bags. We spent an hour relaxing on a lounger by the main pool. 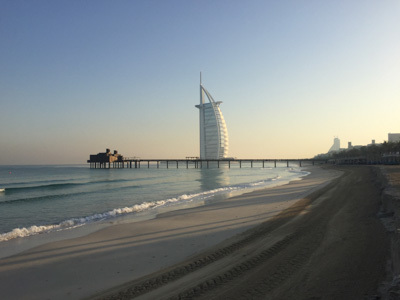 We had decided to stay at the Jumeirah Dar Al Masyaf part of the resort. It was further from the water park and we decided that that meant less family friendly and therefore quieter! 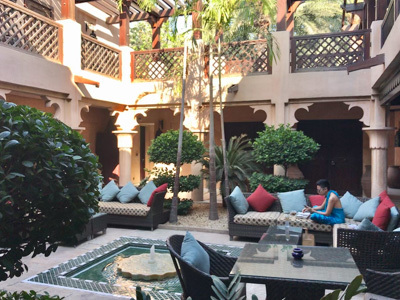 Our room was really large with a private patio, access to an interior courtyard and a pool. Each evening our butler brought us complimentary drinks and nibbles. The resort had a network of canals and small shuttle boats to ferry you about. In reality using one of the golf buggies would be quicker but it was a pleasant way to get to a restaurant in the evening. Sunday 15 April this was going to be a typical resort holiday for us, so lots of eating and little activity. As a result I made a commitment to getting myself out for a run each day. 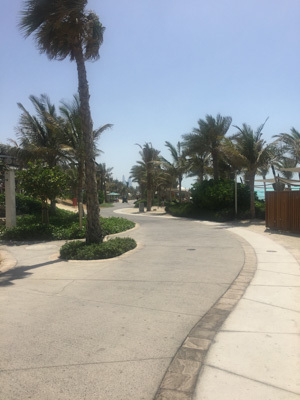 My typical route took me from our villa, along the south west side of the resort and then along the beachfront (with a spur out along the jetty to the Pierchic restaurant), passed the Burj al Arab to the circular marina just beyond. This created a return loop of up to 7km. Sunday 15 April, against my better judgment we booked a session on the squash court. A squash game normally results in Tammay refusing to run for the ball and getting upset with me but we surprisingly had a really good game. Sure, I was going a little out of my way to get around the court but it meant we were both getting good exercise! We ended up having a few games over the course of the week. In addition to the larger main pools we also had access to this pool next to our villa. It was typically very quiet and a great place for a spot of reading. 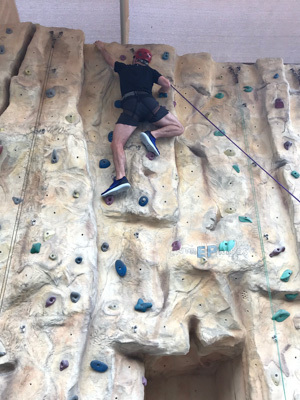 Monday 16 April, we decided to do something a little different and booked a session on the climbing wall. I managed to get to the top but my dislike for heights meant it was a one-time achievement! 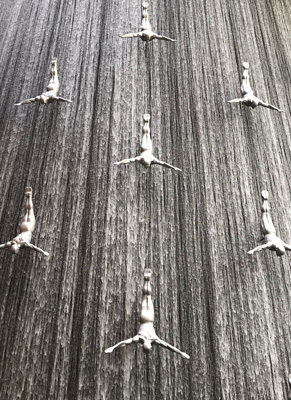 Tuesday 17 April, we ventured out of the resort to visit the Dubai Mall. Not exactly exciting but it seemed like a good idea. Visiting Dubai Mall also meant we could see the Burj Khalifa up close(ish). 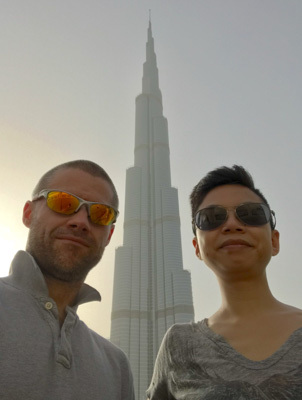 At 828m it's the world's tallest building and I needed quite a steep camera angle to get it all in! After leaving the Dubai Mall we took a taxi to Dubai Marina. In the photos I'd seen it looked like an amazing spot and I was desperate to find a way to get there for a run. The reality however was a little different. Staff from the waterfront restaurants were all trying to entice us in with their photo menus! 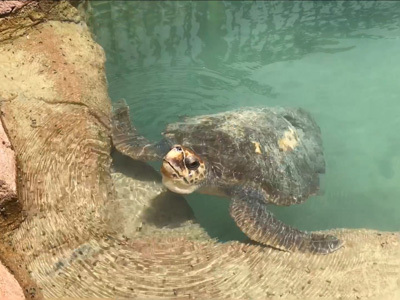 The hotel had a turtle rehabilitation centre which supposedly nursed injured turtles back to health. In fairness I did spot a few turtles with missing flippers. To escape the heat I generally went for a run around sunrise. On those occasions where a 05:45 wake-up was off the cards sunset was the next best option. We normally avoid half board packages but in this case it was perversely cheaper than room and breakfast. 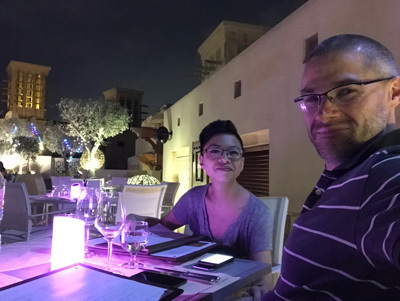 We really didn't need a 3-course evening meal but when it's already paid for it's difficult to turn it down! In general the food was reasonable good but wasn't worth anything close to the prices on the menu. I was sure glad I didn't have to pay attention to the bill! Despite the resort being right on the beach Tammay and I only spent 15 mins walking along the sand. We were far more content with the shade and a lounger next to a pool. 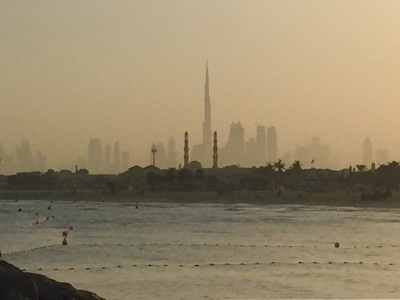 On one of my morning runs I had this view of the Burj through the really murky atmosphere. I wasn't sure how much of this was pollution and how much was atmospheric dust. 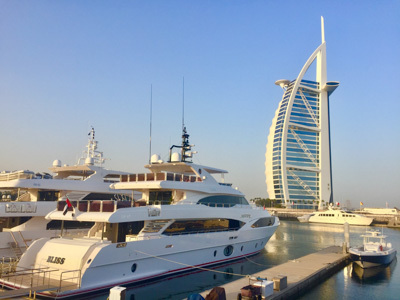 Some of the impressive yachts moored near the Burj al-Arab. Saturday 21 April, our last day. Our flight wasn't until 14:55 so I had plenty of time for a final dawn run. I was treated to this beautiful sunrise on the beach. 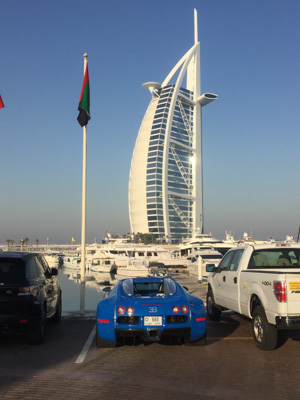 Whilst completing a circuit of the marina I spotted this Bugatti Veyron casually parked next to a pick-up. During the holiday I had managed to put in a run on 7 consecutive days (in addition to a few games of squash!). We had heard that check-in staff were very strict with the carry-on allowance and although we each only had a small bag they were very heavy! 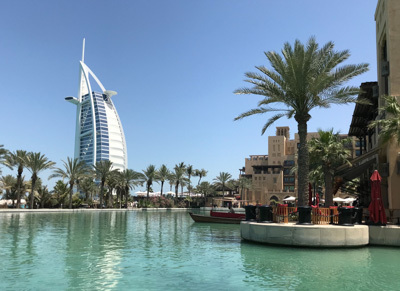 Upon arrival at Dubai airport we changed into our jeans and filled our pockets with any small heavy items we could find to ensure our bags were as light as possible. In the end we were waved straight through, check-in staff clearly didn't believe our small bags could be over the weight limit. PS the following day (Sunday 22 April) I still managed to go for a 7.2km run along The Regent's Canal to Victoria Park. 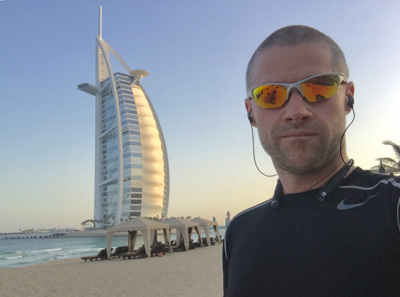 Despite running every day in Dubai I was still carry far too much holiday weight!